The small Kalasha people live in Chitral district of the North Western Province of Pakistan; they have preserved their ancient and unique culture and their pagan religion in Muslim environment. 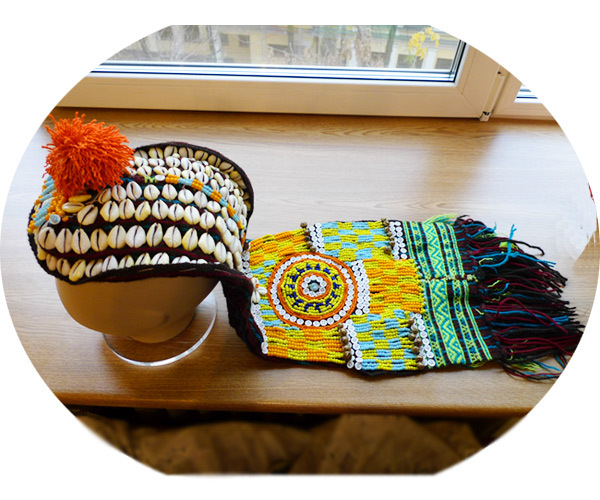 Kupas is a festive headdress of the Kalasha girls, fixable to the head with a dozen of pins. The rich beaded patterns of the long back flap may vary, but all of them have a round symbol of the sun, which the Kalasha highly revere. In addition, there is a mandatory detail in the form of an orange or red pompon on top.